The name badger is probably derived from the French word 'bécheur' meaning digger. 'Brock' probably originated in Scandinavia and is retained in the gaelic languages. Badgers are usually around 90cm long, and on average weigh 10-11kg. They are very muscly and power ful for their size, and - as they are the UK’s biggest land predator - other wild animals will not usually attack them. Antarctica. 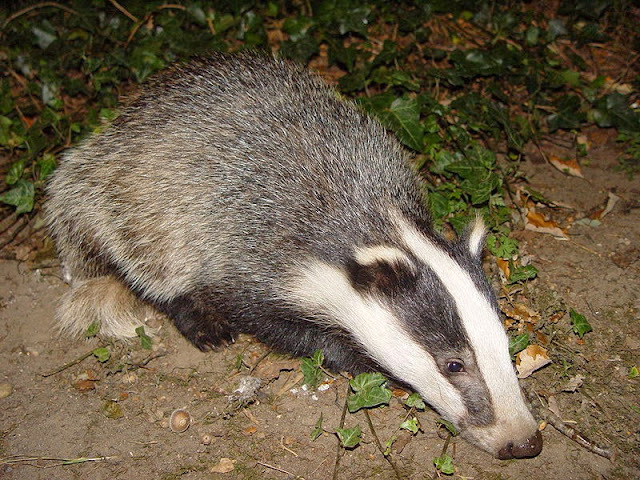 badger (meles meles) is the most widespread over Europe and Asia, but the others include the American badger, the Hog badger of East & South Asia, the Chinese ferret badger and the Indonesian & Palawan stink badger. Badgers are built for digging. Their den can be up to 3 metres underground and contain up to 10 metres of tunnels, with an enlarged chamber for sleeping. Badgers have long strong claws and a streamlined skull enabling them to create these dens and dig prey out of burrows. Badgers also have a second (transparent) eyelid which can be closed to protect the badger’s eye from dirt. This eyelid is called the “nictitating membrane.” Diving birdssuch as the kingfisher also have this second eyelid. When threatened, badgers release a foul smelling musk to drive off enemies. In the face of danger , badgers also become very vocal; hissing and snarling. Badgers are solitary (live alone) for most of the year . Adult males and females only get together to mate in late summer. The honey badger likes sweet honey, but it does not have a sweet personality. A member of the weasel family, this mammal was named the “most fearless animal in the world” by The Guinness Book of Records. Why? Not because of its size. The largest male usually weighs less than 30 pounds, and females weigh half of that. However, both have powerful jaws, razor sharp teeth, knife like front claws and thick, tough, loose skin. If grabbed by an attacker the honey badger can still twist around and bite itself free. In addition, it can make a terrible stink with its scent glands. The honey badger is so fearless that it even eats porcupines and venomous snakes like puff adders and king cobras! They have also been known to take young cheetahs out of dens and to steal the food away from much larger animals like lions and leopards! While it uses it tough personality to hunt all types of animals, this fearless predator sometimes eats melons and berries as well. The only threats to badgers are man and dogs. Man destroys the badger's habitat through development and changes of land use and will block setts and even indulge in badger-baiting. The male badger is called a ‘boar’, the female a ‘sow’ and their young ‘cubs’. After mating the fertilised egg is retained by the sow as a blastocyst until later it implants in her uterus. Although the badger's favourite food is worms, the diet chart shows that badgers are omnivorous. They will eat anything they can reach or catch, be it alive or dead. Badgers live underground in a sett. They prefer well drained soil- holes at different levels improve ventilation. Badgers can live as long as 15 years. However, they rarely survive that long in the wild, with an average life span of just three years. Badger cubs are usually born in late January or February. They’ll spend their first two or three months underground, being looked after by their parents, and will only come to the sur face in the spring.